A newly formed Community Oversight Advisory Board can benefit from Portland’s history of seeking improved police accountability. We’ve compiled a record of prior involvement, by city consultants, social justice advocates and public testimony. Grasping line item details of the 77-page Agreement will be a daunting enough task for citizen volunteers. We remind COAB members that investigators’ prior Findings identified an even broader set of problems, not all of which were addressed in the rush to a negotiated settlement. 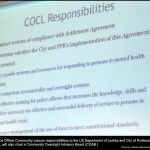 Item 141 (b) in the Agreement, authorizing COAB to recommend ‘additional actions,’ offers opportunity to finally propose comprehensive police reform. An in-depth understanding of the Findings is indicated, if reformers intend to address a complex set of problems. It’s not as if community members need to re-invent the wheel. We invite COAB participants to learn from the historical record. Reasoned positions favoring police accountability have appeared in our public records for generations now. We strongly urge COAB members, as they take up their mission, to order existing reports be gathered and collated for their review. We’ve identified three official sets of records. Political appointees, to what DoJ Findings (pg. 28) describe as Portland’s ‘self-defeating accountability system,’ joined police accountability advocates seeking to influence hearings before City Council. We urge COAB to attend to sentiments expressed on 1 & 15 November, 2012, as Commissioners received testimony on the plea deal. Portland’s Auditor would be able to supply video records – as well as submitted, written testimony – for those dates. Consult Hardesty was intimately involved in generating public testimony before the 9th Circuit Court in February, 2014. 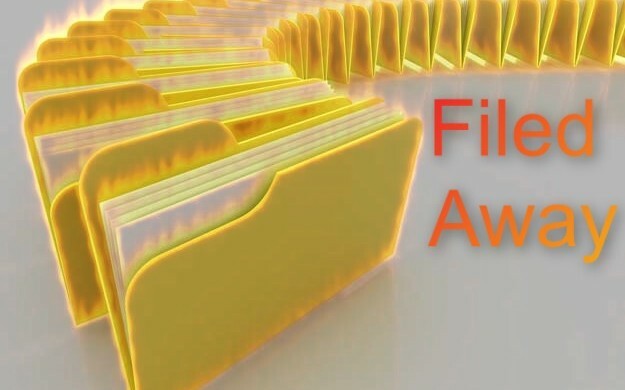 We encourage COAB members to read written testimony as well as transcripts of oral testimony. Participation was so robust, Judge Simon kept the record open for an additional week, to be as inclusive as possible. We present some of our collaborators’ published testimony here. For more than a decade, a series of City administrations have sought professional analysis of deficiencies in local policing. Two groups engaged in this work. The Police Assessment Resource Center team began in 2003, after the police homicide of Kendra James, a young, unarmed, African American mother. In 2010, the City employed the OIR Group (principally Michael Gennaco & Robert Miller). Initially tasked with assessing the brutal, 2006 police homicide of unarmed James Chasse, a series of police killings indicated ongoing need. August 2003 Two in-custody deaths and thirty-two officer involved shootings, between 1997 and 2000; 89 change recommendations. Executive Summary, here. August 2005 (First follow-up) Fourteen shooting incidents (likely including Tyrone Waters, Raymond Youngberg, Jose Mejia Poot, Daniel Brink, Lawrence Ramirez and George Waldum); and ten new change recommendations identified. December 2006 (Second follow-up) Ten more shooting incidents, from 1997 to 2002; sixteen change recommendations. Executive Summary in brochure form, here. February 2009 (Third follow-up) Twelve shooting incidents (totaling 70), change recommendations reach 124. Executive Summary in brochure form, here. July 2010 (Report to the City of Portland Concerning the In-Custody Death of James Chasse) Twenty-seven recommendations. May 2012 (First Report) Seven officer-involved shootings: James Jahar Perez (2004); Raymond Gwerder (2005); Jerry Goins (2006); Lesley Stewart (2007); Jason Spoor (2008); Aaron Campbell and Jack Dale Collins (2010). Thirteen recommendations. July 2013 (Second Report) In-custody death of Timothy Grant (2006); and six officer-involved shootings: Marcello Vaida (2005); Dennis Young, Scott Suran and David Hughes (2006); Osmar Lovaina-Bermudez (2009); and Keaton Dupree Otis (2010). Thirty-one recommendations. November 2014 (Third Report) In-custody death of Darris Johnson in (2011); and eight officer-involved shootings: Dupree Carter (2006); Steven Bolen and Jeffrey Turpin (2007); Derek Coady (2008); Craig Boehler, Darryll Ferguson and Marcus Lagozzino (2010); and Ralph Turner (2011). Twenty-one recommendations. January 2016 (Fourth Report) In-custody deaths of Thomas Higginbotham (2011), Billy Wayne Simms and Brad Lee Morgan (2012), Merle Hatch and Santiago Cisneros (2013). Six additional, non-fatal shootings. Five in this reporting group were unarmed, one had an unloaded pistol. Thirty-one recommendations. February 2018 (Fifth Report) Deaths of Kelly Vern Mark Swoboda (2014) and Alan Lee Bellew (2015). Non-fatal shootings of Paul Alan Ropp and Denorris Laron McClendon (2014), Michael Shawn Harrison (2015). Ryan Matthew Sudlow (2015) was fired at, but not injured. No analysis of race. Twenty-six recommendations. January 2019 (Sixth Report) UPDATE Officer-involved homicides of Nicholas Glendon Davis (2014), Christopher Ryan Healy and Michael Gregory Johnson (2015), Steven Wayne Liffel (2016), Quanice Derrick Hayes and Terrell Kyreem Johnson (2017). Non-fatal shootings of David James Ellis (2015), Timothy James Bucher (not hit, 2016), Don Allan Perkins (2017). Forty recommendations. “City’s own history of racial inequality and Displacement” cited, pg. 3. The City of Portland has never disciplined an officer for unlawful use of lethal force, despite paying millions of dollars in wrongful death settlements. In a few instances, consultants demonstrated integrity sufficient to call the City out for repeated unwillingness to adopt best practices; notably regarding Portland’s ’48-hour rule,’ which officers have used to concoct plausible shooting scenarios for Internal Affairs investigators. In addition to receiving the wisdom of police professionals, we submit COAB members will obtain historical perspective. They’ll be able to deduce how the City has been repeatedly called to attend to never-implemented reforms. Hopefully they’ll be able to anticipate methods local authority is likely to employ to refute their good work. Official records are but a starting point. Each plan of action kicked off a community response. Community-based police accountability advocates have, throughout this history, sought to illuminate policies we assert are more likely to inhibit unjust policing. 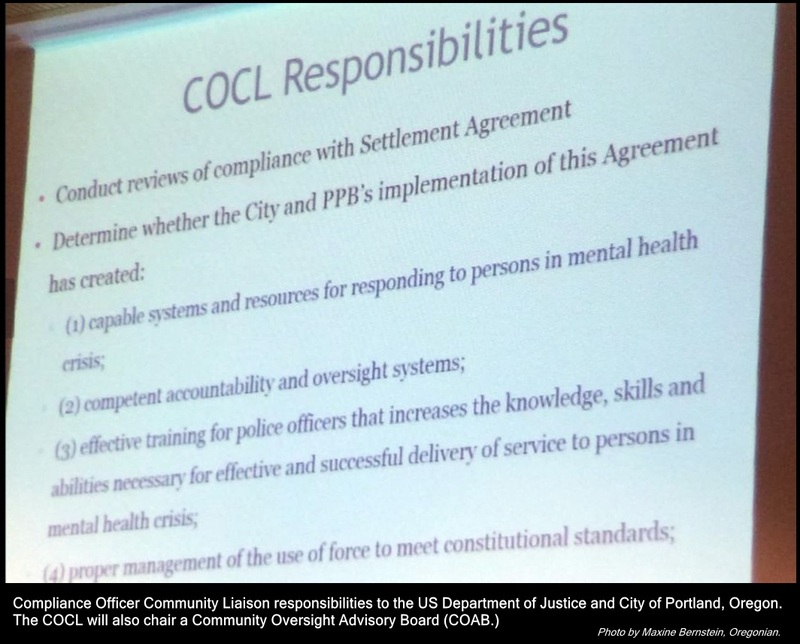 Portland Copwatch has offered excellent analysis following each consultant’s report. Here is their comprehensive criticism of the 2005 PARC report. It’s a starting point: COAB should consider hiring Portland Copwatch to assemble their entire history of studied contributions. Portland’s chapter of the League of Women Voters have been giving input on our police oversight system since participating on the Storrs Committee in 1982. COAB would benefit from a collation of their work. Testimony here, drawn from the Findings, anticipated community participation in a negotiated settlement in 2012. The American Civil Liberties Union of Oregon also retains long-term perspective. Here is their initial round of 2012 testimony. In addition to this institutional memory, COAB has available a growing pool of resources … as the community produces ever broader perspectives from those who’ve diligently assessed the City’s illegal conduct. This post collates 2014 testimony provided in Federal Hearings last year. We link to our own submission, that of the Mental Health Association of Portland, Disability Rights Oregon, and local chapters of the National Lawyers Guild and National Association on Mental Health. In addition to astute individuals, all draw attention to the Agreement’s inadequacies. UPDATED: City consultants shunt aside concerns for racism in policing. Consult Hardesty specifically asked Perez, as investigation began in 2011, whether the DoJ would investigate for race-based civil rights violations. He assured us his team would, “follow the facts, wherever they lead.” Subsequent Findings (pg. 38) referenced the City’s own traffic stop data … demonstrating vast racial disparities in police stops, searches and subsequent legal interaction in the justice system. The DoJ Civil Rights Division in the next paragraph declared racism beyond the scope of their investigation. It’s not as if we’re advocating COAB adopt city consultants’ recommendations. Pg 84 of OIR’s 2013 report gives police justification to intrude on the life of Keaton Otis: “Mr. Otis was wearing a hooded sweatshirt … was slouching … did not seem to fit the car; Mr. Otis looked like he could be a gangster,” AND THEN saluted cops for being able to articulate ‘race-neutral reasons’ for a fatal traffic stop. ← A Sign of Things to Come?